After „Otherworld“ decided not to publish further Andrew Mayhem-novels your German fans were deeply disappointed and nearly resigned to have to switch to English to be able to read on. How did you feel when a new German publisher asked to translate your books? I actually heard about both pieces of news in one e-mail. So there was no time for me to scream „Oh, poor, poor me! It’s just not fair! How could they do this to me?“ and cry and kick over furniture. 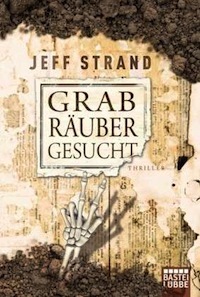 Bastei Lübbe is reprinting the first two books, so hopefully the fans will demand Casket For Sale (Only Used Once) and Lost Homicidal Maniac (Answers to „Shirley“) as well! How did you come up with Andrew Mayhem? I wanted to try to write an ongoing mystery series, and I needed a twist for my hero. I thought it would be funny if a private investigator had two bratty little kids that he had to take along while he was off investigating crimes. So that was the basis for the character. Of course, it stopped being a mystery series after the first book, and his kids weren’t in Single White Psychopath Seeks Same very much, but that was the original idea. Now the character is defined by his bad luck and his poor decisions, which get him into all kinds of ghoulish trouble. Most of the time it just comes naturally to me. Graverobbers Wanted (No Experience Necessary) wasn’t planned to be that dark–it just happened while I was writing it! Occasionally it will be planned out. My editor on Wolf Hunt was very clear that he wanted a HORROR novel, so I made sure it was extremely violent and gory. But usually it’s just the way my mind works. I’m weird. Why did you continue with novels about Andrew Mayhem? Is he one of your favorite heroes? He was always meant to be a recurring character, and I wrote the first three books very close together. When I started the series, I thought I was going to do a book a year! But then I wrote a novel called Pressure, which turned out to be my bestselling and most popular book, so even though I always wanted to do a fourth Andrew Mayhem book, I kept writing other things instead. Currently many novels are being turned into graphic novels. Do you have plans for something similar with your work? If a publisher came to me and said „Hey, we want to turn your books into a graphic novel!“ I would say „Sure!“ But it’s not something I’m pursuing on my own. I’m very interested in writing comic books, but if I were writing the scripts, I’d want to do an original series instead of an adaptation of my books. I love the idea of doing an ongoing serialized story. Which author/movie/comic book would you say has inspired you the most? Early in my career, it was Douglas Adams and Dave Barry, and also RL Stine, though not because of his horror writing…when I was a kid, my favorite magazine was Bananas, which he wrote for. 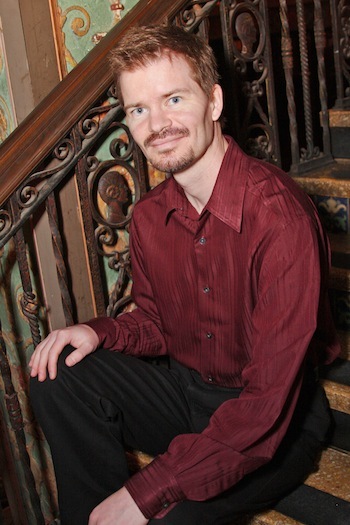 Then, as I started writing more horror, I went in sort of a Richard Laymon direction. I read almost nothing but horror fiction for a long, long time…and decided recently that I need to branch out more. Some of my favorite novels I’ve read recently are The Amazing Adventures of Kavalier and Clay by Michael Chabon, Carter Beats the Devil by Glen David Gold, I Love You Beth Cooper by Larry Doyle, and going even further back, Lonesome Dove by Larry McMurtry. I also love to read non-fiction books about horror movies. Your novels are full of humor. Do you have a humorous streak to be able to find a spark of laughter in even the most horrendous circumstances? Yes. I don’t think I’d ever want to write, or even could write, a book without any humor. Even books like Pressure, Dweller, and Faint of Heart, which I describe as my „serious“ books, have lots of humor. Which makes people think that I’m a great big obnoxious clown in person, but I’m usually the quiet one in the group. What new books are you currently working on? Are there plans to publish more novels in Germany? 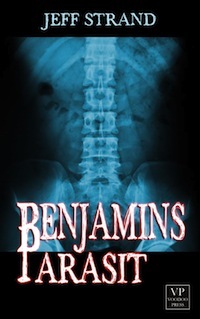 Voodoo Press is going to publish German-language editions of my novels Benjamin’s Parasite, Fangboy, and The Sinister Mr. Corpse. Right now I’m working on a few different projects at once, two of which are on opposite ends–I’m trying to write my funniest book ever, and also my scariest book ever. Thank you for your time. I am happy that Andrew Mayhem has been „resurrected“ in Germany! Thank you! I’m happy, too!